Can I get heated seats? Do I have to get a sunroof? 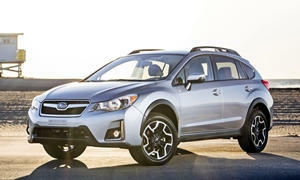 Find out what you need to know about Subaru features right here. Lead vehicle start alertPrompts the driver when the vehicle ahead of the car has started moving away, a sign that the light has turned green. Prompts the driver when the vehicle ahead of the car has started moving away, a sign that the light has turned green. PIN Code AccessCan unlock car by tapping an outside button in the correct sequence. Tedious to program and use. Can unlock car by tapping an outside button in the correct sequence. Tedious to program and use. Lane sway warningAlerts driver when the car is weaving within the lane. Alerts driver when the car is weaving within the lane. Torque vectoring, brake-basedUses the brakes to channel torque to the outside wheels and counteract understeer. Similar to stability control, but proactive, and acting to improve cornering performance rather than prevent loss of control. Uses the brakes to channel torque to the outside wheels and counteract understeer. Similar to stability control, but proactive, and acting to improve cornering performance rather than prevent loss of control. Smartphone integrationIn BMWs includes baseplate in center console that provides a connection to an external antenna, but that requires an additional adapter. In BMWs includes baseplate in center console that provides a connection to an external antenna, but that requires an additional adapter. Steering-linked fog lightsFog light on the appropriate side turns on (and might also swivel) when the steering wheel is turned. Requires and does not include value of fog lights. Fog light on the appropriate side turns on (and might also swivel) when the steering wheel is turned. Requires and does not include value of fog lights. Raised heavy-duty suspensionOnly listed if not standard on all trims. No value because no way to compare across models. EyeSight, High Beam Assist, Moonroof, Nav, and HK Pkg. EyeSight, High Beam Assist, and Moonroof Pkg. None of our members have yet commented on the available features of the 2019 Subaru .